Viking Berserker Natural Ale / Drinking Horn with Leather Holder | BUDK.com - Knives & Swords At The Lowest Prices! Glasses - meh. Don’t drink like a pansy! Gulp down beer from the all-natural "Viking Berserker" Ale Horn, just like your marauding, mead-quaffing Viking ancestors. 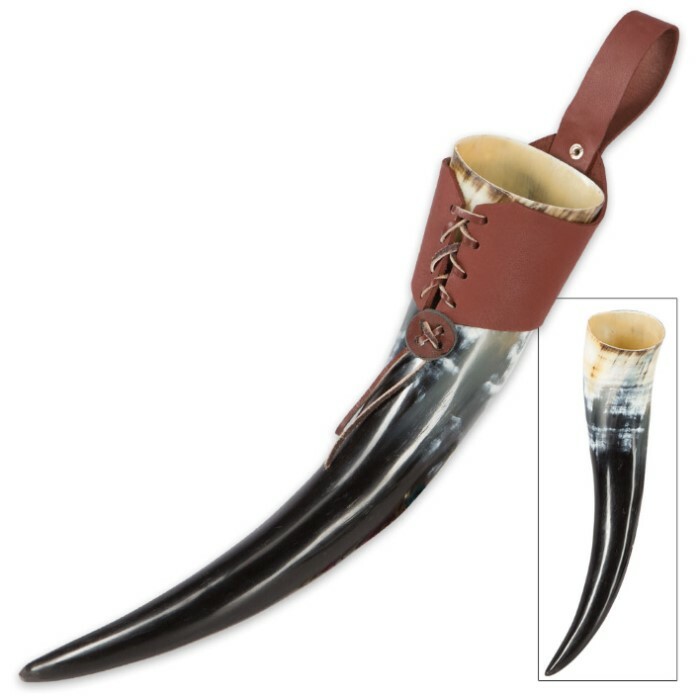 At typical gatherings full of imbibers grasping boring red plastic Solo cups filled with weak, straw-colored American lager, you’re sure to become the life of the party glugging rich dark brown ale from this drinking horn, fit for a real man’s man of a weekend warrior! Handcrafted from genuine steerhorn, this distinctive, exquisitely unsophisticated drinking vessel is beautifully polished to a sleek high gloss to highlight the unadulterated ebony, charcoal, umber, cream and countless other hues found deep-rooted in the handsome natural horn grain. Each horn is unique, so colors will vary from piece to piece. The horn takes its name from the legendary Viking battle style, called "berserker" by those unlucky enough to be on the receiving end. Ignoring all conventional battlefield tactics of the day, it's said these Iron Age "berserker" warriors used magic to work themselves into trance-like frenzies, making them impervious to injury. One of the "magical" techniques employed was downing massive volumes of high-alcohol beer, which the brutal fighters even carried into battle with them. With the "Viking Berserker" Ale Horn's included genuine leather "holster," you, too, can carry your ale into battle or wherever your drinking adventures take you! 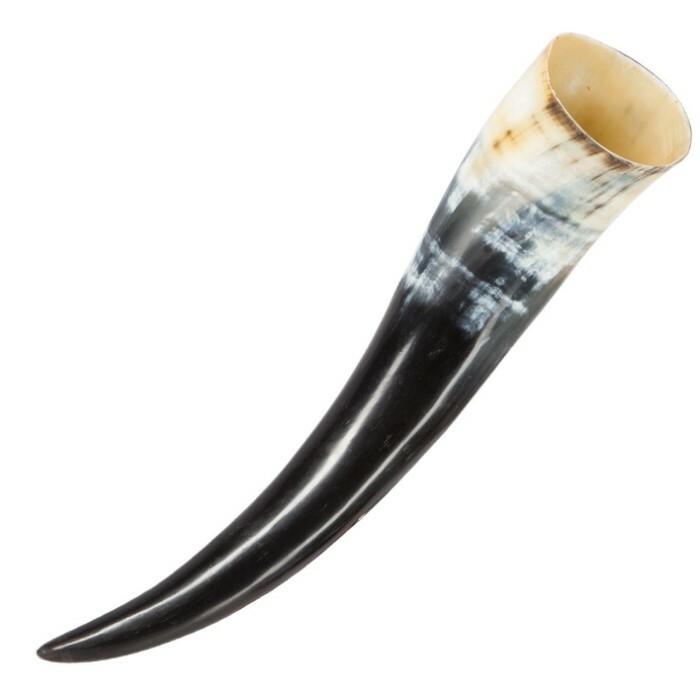 The Viking Berserker Natural Ale Horn is also great for display or as a prop for theater, screenplays, re-enactments or cosplay. Don't forget your drinking buddies! The "Berserker" horn makes a terrific gift for individuals of Scandinavian descent, history buffs, Iron Age scholars and anyone who likes to drink and look cool doing it!